Turkeys, turkeys, turkeys. Turkeys are my dears. And Thanksgiving is my dear, too. So in honor of the Thanksgiving season, here are my new turkeys this year (I already have very many). First off is this little bowl I found secondhand last week. Given that I already own the matching teacup and saucer, it was a nice find. This wooden trivet is a handmade item I found at Wheat's Fair Trade Store. Always good to keep them in mind for products like this. World Market kept going with their dressed-up turkey this year by putting him on a name card holder. I probably won't be using it in the intended way, so I just got one. 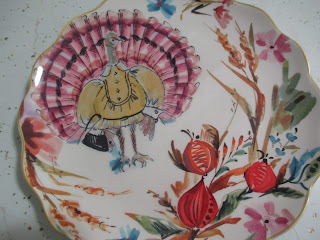 From their new plates this year, I went for the lady turkey and skipped out on the tom because I already have him on a previous design. I don't mind the clothing on the turkeys, but I do wish they'd left out the purse. It takes away from the tone to me. Somewhat similar in style is my Masha D'yans calendar. Her work is so fun, and the November illustration is no exception. One antique store find out of two. This one is made of shells and the other is a green, Navajo folk art piece (I didn't get a picture of that one). I think this is the first Thanksgiving I've had both of them. Last is the little clay turkey someone gave me. It's sitting happily on my whatnot shelf with all the pigeons. Just one week left in the time of the turkeys.